Or they must turn and face The Fortress, find out its secrets, and use them against it. Seize their lives back, and fight for their very right to exist! 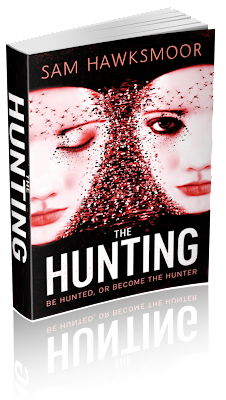 The Hunting is the second book in The Repossession series, and it picks up exactly where the first book left off. More than 36 kids had been kidnapped and used as guinea pigs in teleportation experiments performed by the cold-blooded scientists working for the Fortress. Majority of them lost their lives. Only a small group of kids managed to survive and escape, and now they're being hunted down, one by one, and taken back to the underground research facility to be used in yet more vile experiments. Genie, her boyfriend, Rian, and Rian's sister, Renee are on the run. Accompanied by the rabbit-chasing Mouncher, they managed to escape downriwer to Vancouver on a raft. But they're not safe yet. They survived the teleportation. They're extremely valuable. And the Fortress will do anything it takes to capture them. I enjoyed getting to know the supporting characters a bit better, especially the feisty red-head, Geenie and her genius love interest, Cary. There were times when Geenie really got on my nerves (she can be pretty annoying! ), but she eventually grew on me. One thing for sure, I will never forgive Ri, the way he acted in the final chapters was unacceptable. I still don't understand what brought about such a dramatic change in his behaviour. I am, however, looking forward to see if Rian and Renee will be able to work things out!